Like the deadpan comic Rodney Dangerfield, forests "don't get no respect" when it comes to their potential as a solution to climate change. A decade after tropical forests entered international climate negotiations, people now understand that losing trees to deforestation or degradation contributes to emissions, and they know more trees means more carbon dioxide taken out of the air. But, as argued in our book, Why Forests? Why Now? mobilizing global action on conserving and restoring forests to address climate change is more important, more affordable and more feasible than most people think. The way forest-based emissions are reported obscures the importance of deforestation as part of the current emissions problem, as well as the potential of forests as a climate solution. That's because forests can be either sources or sinks, depending on how we manage them: when undisturbed, even mature forests actively capture carbon from the atmosphere through photosynthesis, acting as a safe and natural carbon capture and storage technology. When net forest emissions are reported as a share of total global emissions, the number is the result of a subtraction: gross emissions from deforestation minus the carbon captured by forests through regrowth. Yet mitigation potential is an addition: gross emissions (that can be avoided by stopping deforestation) plus the result of the carbon capture function that can be maintained and even enhanced. 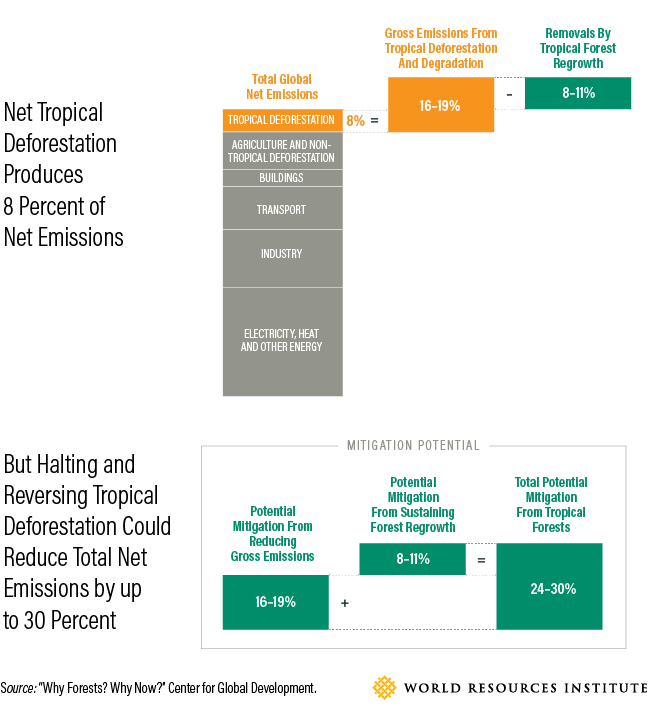 Halting all tropical deforestation, while allowing damaged tropical forests to recover, would reduce carbon in the atmosphere by an amount equivalent to up to 30 percent of global net emissions. Recent studies by Climate Focus and The Nature Conservancy have confirmed the critical role of forests in keeping global temperature rise below 1.5 or 2 degrees Celsius, respectively. 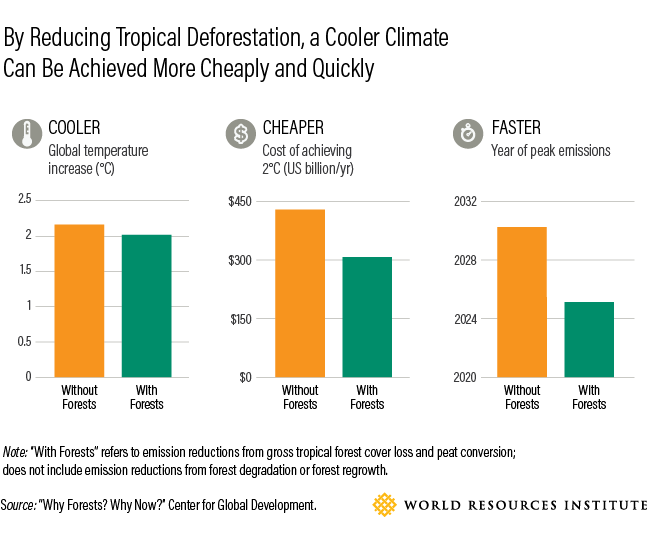 Including reduced tropical deforestation in global climate mitigation strategies toward the 2 degree goal would save more than $100 billion per year through 2030, even if every land-user had to be compensated for not converting forests to the most suitable agricultural crop. But even that estimate can overstate the costs of forest protection that countries would have to incur to achieve climate protection goals. For one thing, much current deforestation is illegal – for example, taking place in officially protected areas, or as the result of obtaining irregular permits or impunity through corruption – and such land-users need not be compensated. During the decade starting in 2004, Brazil achieved dramatic reductions in deforestation rates in the Amazon through mostly command-and-control measures, at an out-of-pocket cost of less than $5/ton of avoided carbon emissions. This compares to a carbon price of $25/ton widely considered to be on the low end necessary to achieve long-term emission reduction targets in the United States. Second, estimates of the cost of forest protection don't incorporate the local and regional benefits of the ecosystem services that forests provide, above and beyond carbon storage. These include, for example, roles in generating the rainfall that maintains agricultural productivity, preventing the siltation of reservoirs behind hydroelectric dams, and buffering vulnerable communities from the impacts of extreme weather events. While it is challenging to assign precise economic values to such benefits, the contributions of forests to Sustainable Development Goals related to poverty, hunger, health, water and energy are considerable. Do we need a new "big idea" to capitalize on the potential of forests as a solution to climate change? No – we already have a global consensus on the way forward. We just need the money. The Paris Agreement endorses a framework for cooperation agreed upon in Warsaw in 2013, REDD+, in which rich countries pay developing countries for their performance in reducing forest-based emissions. Various bilateral and multilateral initiatives have piloted REDD+ agreements, and the Green Climate Fund has recent approved a new $500 million fund for REDD+ results-based payments. In 2014, a broad range of stakeholders came together at the United Nations Climate Summit to endorse the New York Declaration on Forests. Signatories to the Declaration commit to remove deforestation from commodity supply chains by 2020, and end deforestation and restore 350 million hectares of forest by 2030. But as we argued in Why Forests? Why Now?, finance remains the missing piece. Compared to other sectors that are the focus of attention and funding to reduce emissions from fossil fuels, forests are the neglected step-child in the family of climate actions: a recently released assessment of Goals 8 and 9 of the New York Declaration estimates that forests garner just over one percent of global development funds for mitigation. Developing countries should take advantage of forest mitigation potential by enhancing the profile of forests in their Nationally Determined Contributions, and rich countries should commit to provide the financing commensurate with that potential. Next Sunday, November 12 in Bonn, a "Forest Day" will bring together leaders on the forests and climate agenda from governments, the private sector, civil society, and indigenous groups under the rubric of the Marrakech Partnership for Global Climate Action. If similar events in the past are any guide, speakers will likely be preaching to the choir, and most attendees will be those who are already converted to the forest cause. It's time to broaden the congregation, and move forests from the margins to the mainstream of climate change discussions.